Excited for day five of the 12 Days of Christmas Crafts? I am, I am! Today we have Vanessa, from The Crafty Nest, who will be sharing a very sweet treat with us today! Yum, yum! I am definitely going to be making these. Welcome Vanessa! Hey guys! 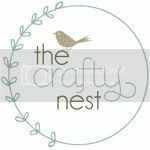 I'm Vanessa from The Crafty Nest, where I blog about my love for glue guns and glitter. I suffer from craft ADHD, regularly working on at least 10 projects at the same time. My craft room tends to look like a tornado blew through it. I live in the Arizona desert with my husband (aka Mr. Crafty Nest), our son Logan and our 2 cats. I'd love for you to stop by my blog! A huge thanks to Audra for having me over at her lovely blog. 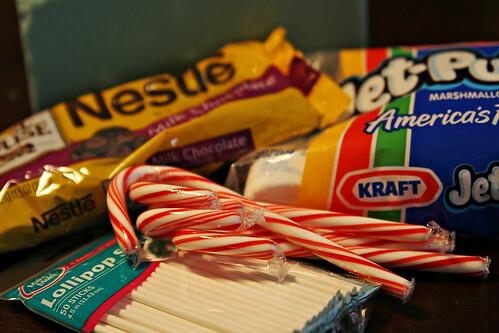 I thought I'd show you how to make candy cane marshmallow pops. After all, everything tastes better on a stick. These pops are super easy to make and your wee little ones can help you. Even my 16 month old got in on the candy cane crushing action. 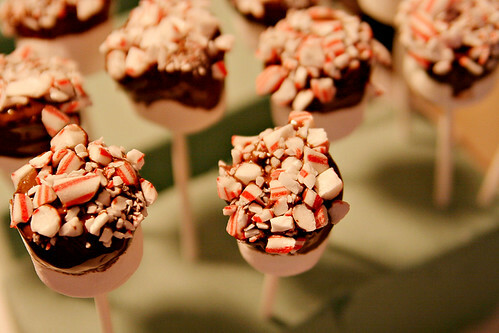 Eat these while sipping on some hot chocolate. Heck, plop one in your hot chocolate and use as a stir. Enjoy! 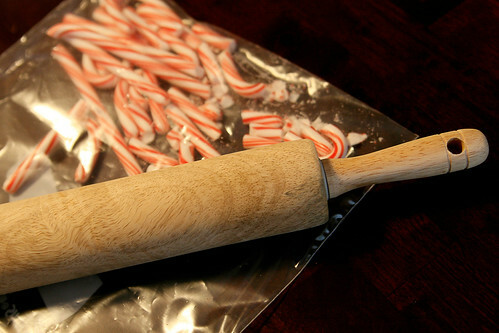 Step 1: Finely crush 6 candy canes in a food processor or place candy canes in a large zip lock bag and crush with a rolling pin. 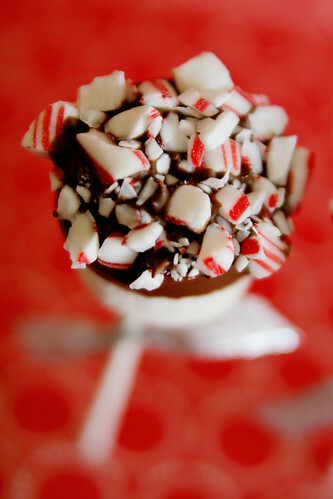 Leave the candy cane pieces a bit chunky. 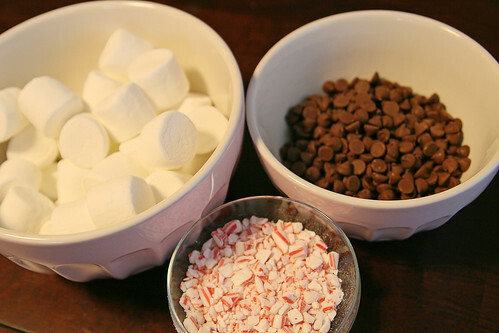 Step 2: Set out your ingredients (marshmallows, lollipop sticks, chocolate chips, crushed candy canes) so you are ready to start dipping. Step 3: Melt chocolate chips according to the directions on the bag. I melted my chips in the microwave for 1 minute, stirred, melted for an additional 30 seconds, stirred, melted for a final 30 seconds and stirred. 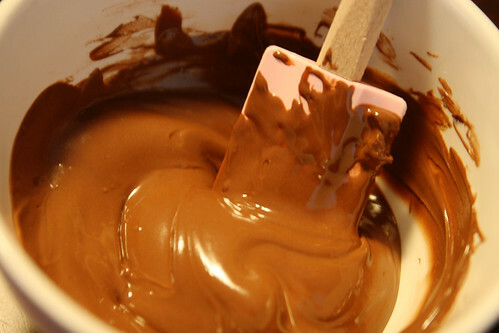 Every microwave will vary, so continue melting and mixing until you get the right consistency to start dipping. 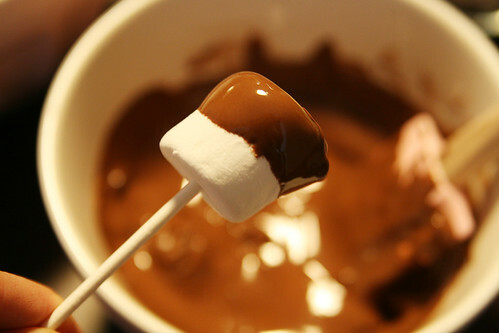 Step 4: Stick a lollipop stick in a marshmallow and dip the marshmallow halfway in chocolate. It may be easier to hold on to the marshmallow, instead of the stick, while dipping. 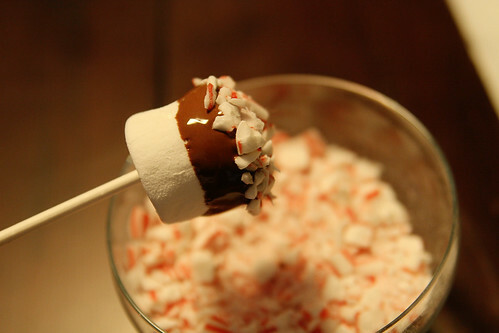 Step 5: Dip the top of the chocolate covered marshmallow in the crushed candy canes. Step 6: Stick the marshmallow pop in floral foam and allow the chocolate to dry. Step 7: Repeat steps 4-6 until you run out of chocolate. Enjoy! 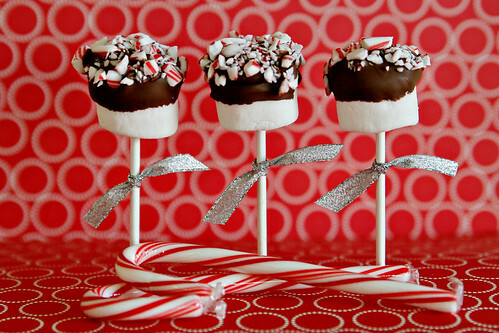 So pretty.. so yummy... why can't we have our candy cane marshmallow pop and eat it too?! I guess you just have to make a bunch! Yummy! I really like you blog design btw, who did it?? What a fantastic holiday treat! 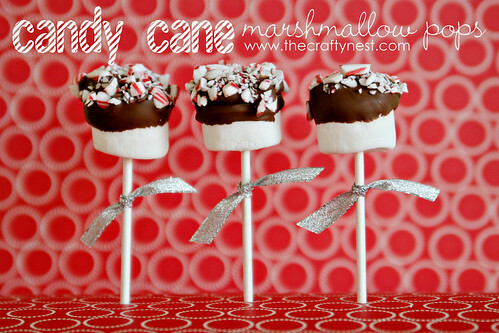 These are so cute and look easy to make...a winning combination. Thanks for sharing! Those look easy enough for my girl scouts to do! Might have to try it.